Article in Dutch Magazine De Architect about our Fire Wall 3DCP-experiment in collaboration with TU-Eindhoven most popular item this week! For the whole article (in Dutch) click here. On December the 6th the Center for Healthy Schools organizes an inspiration session at our School Campus in Peer. With various talks, drinks and guided tours throughout the campus it promises to be a fascinating afternoon. Bekkering Adams will be present and Monica Adams is one of the speakers, explaining about the design and the design process. For the full program, see the invitation of the Center for Healthy Schools. We would be honored to welcome you in Peer on December 6th. Participation is free, however, the number of places is limited, so do not wait too long to register! Direct registration can be via this link. The School Campus houses more than 1,250 students and forms a beautiful ensemble of four education-related buildings surrounding a publicly accessible park with facilities for playing and sports. 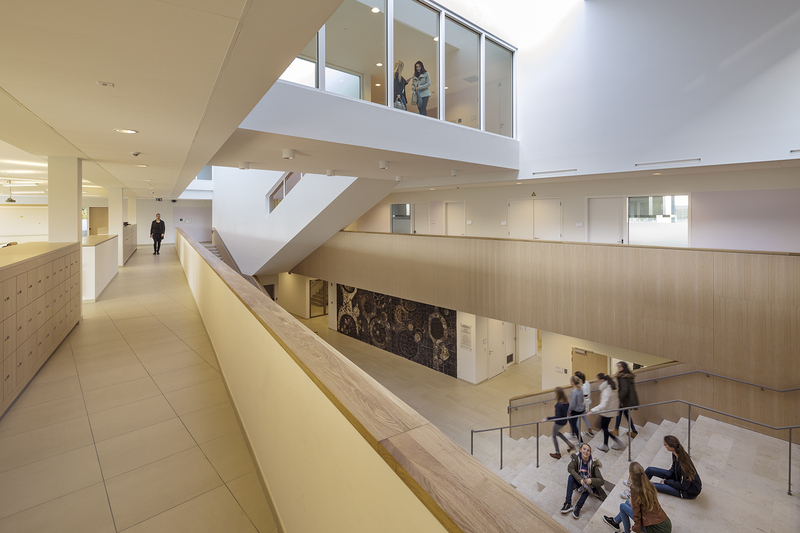 With an area of ​​18,500 m², the campus is in the top 5 of the largest projects within the Flemish public-private program Scholen van Morgen. The complex with a secondary school, elementary school, sports complex and boarding school replaces all the buildings of Peer free education in one go. The project is designed as a landscaped ensemble, with the sports fields, playgrounds and public park designed as an integral part of the campus. Hope to see you December 6th in Peer! This week, Eindhoven is bustling with talented designers showing and discussing inspirational ideas about the future. We are proud to be part of it, showing our 3D-concrete printed Firewall, which we developed together with the TU Eindhoven. You can see it at 'Het Klokgebouw' in de Strijp-area in Eindhoven. DDW runs until Sunday 29th of October, so be quick not to miss it! After an extensive process the contractor for the Preliminary school, sporthall and healthcenter Cicero in Evere is finally selected. We are happy to pronounce that the multifunctional complex will be build by Strabag, the same contractor we have recently finished the Schoolcampus in Peer (also in Belgium) with. Contractor Strabag plans to start beginning of October. Juliette Bekkering, together with Michiel Riedijk of Neutelings Riedijk architects, will participate as Guest Professors in the International Architecture Summerschool - Galapagos 2017, organized by the Universidad San Francisco de Quito. 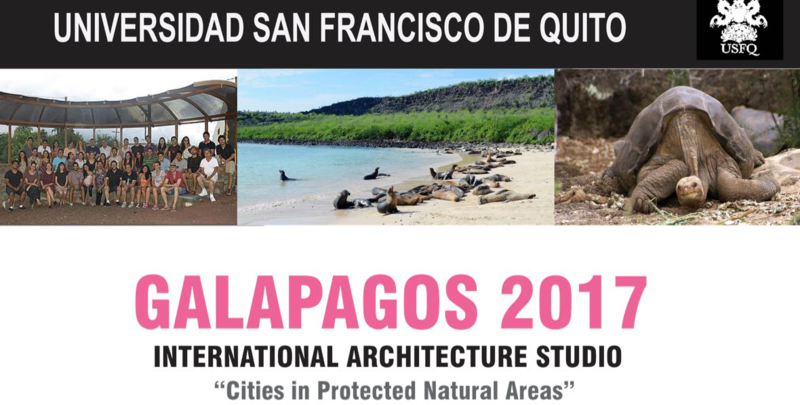 The main focus of the summerschool to explore ways to design architectural interventions in the heritage natural protected areas of the Galapagos. If you like to read more about the Galapagos report, click here. This Saturday, 17th of June', during the day of Architecture, Archikidz will take place in the Scheepsvaart & Transport College in Rotterdam. Around 300 children will get creative with a diversity of building materials, dreaming a future in and around the River Maas. Frank de Vleeschhouwer of Bekkering Adams architects will be one of the guiding architects, helping them to realise their fantasy. Read more on the website of Archikidz. If you rather look at architecture then making it; you might like to look here at the programme of Dag van Architectuur, which this year takes place in the Martitiem district and Wilhilminapier (June 17th and 18th). Theo Salet, professor of TU Eindhoven Department of the Built Environment (Chair: Material related Structural Design - Concrete Structures), explains how the design Fire Wall explores a new and artistic side of the 3D concrete printing layering, which technique is trigging curiosity and becoming famous all around the world. Schoolcampus Peer: a big success! Secondary school Agnetencollege is such a big success that for the coming year there is already a waiting list for new students. Het Nieuwsblad in Belgium published a news item about Agnetencollege in Peer with the following title: New school immediatly full. 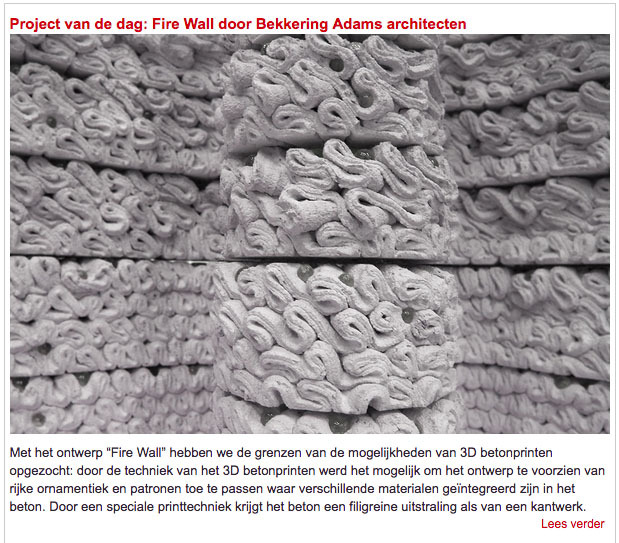 FRAME: "3D printing is making an impression on concrete"
We are proud to be published in the news feed of FRAME web with our latest design Fire Wall and its 3D concrete printed prototype. FRAME interviews Juliette Bekkering about what inspired the proposal, how concrete printing can fit within the industry and what are the next challenges of this design. Reat the full article here. 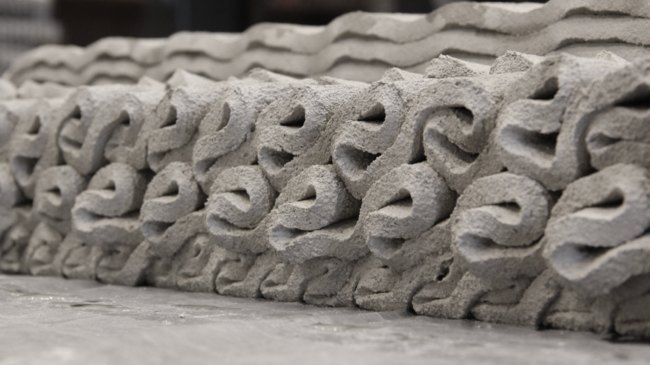 "Met het ontwerp ‘Fire Wall’ zijn de grenzen van de mogelijkheden van 3D beton printen opgezocht: door de techniek van het 3D beton printen werd het mogelijk om het ontwerp te voorzien van een rijke ornamentiek en patronen toe te passen waar verschillende materialen geïntegreerd zijn in het beton..."
Juliette Bekkering and Frank de Vleeschhouwer, interviewed by Ad Tissink, talk about Bekkering Adams latest project, 3D concrete printing Fire Wall, and their approach to concrete printing technology. 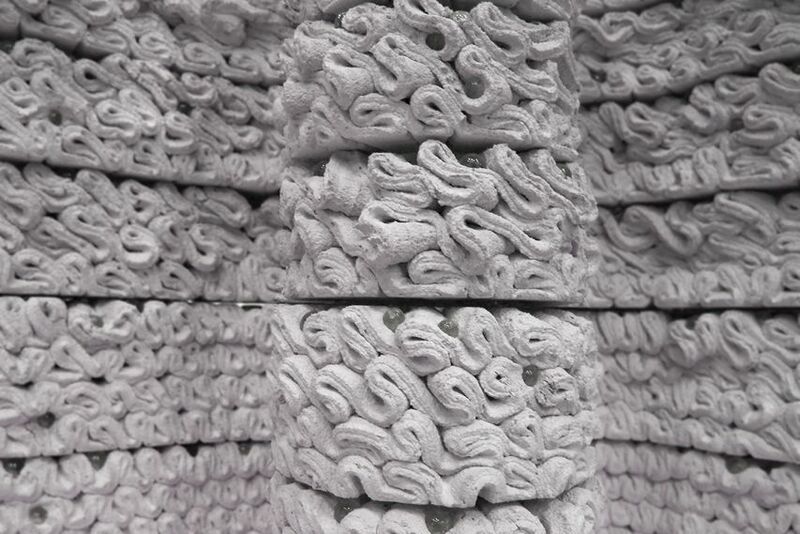 "We wanted to print intricate patterns and experiment with integrating various functions and materials in a single object.."
Architectenweb describes the first impressions of the three prototypes winner of "3D concrete printing Challenge", displayed at Bowbeurs 2017. Design proposals and several models from Prof. Juliette Bekkering's graduation students are being displayed at the BouwBeurs 2017. The aim of the studio is to develop designs and prototypes of community and public buildings that support self-development within refugee-camps around the world. Juliette Bekkering presented the 3d conctrete printed prototype of our latest design "Fire Wall" at the BouwBeurs Fair 2017. During her lecture she explained the benefits of combining design and 3d concrete printig technology, referring to three themes characteristic of Bekkering Adams Design: Sculpturality, Ornamentation and Material research. If you are inspired or just curious to learn more about this contact us or read more about it. 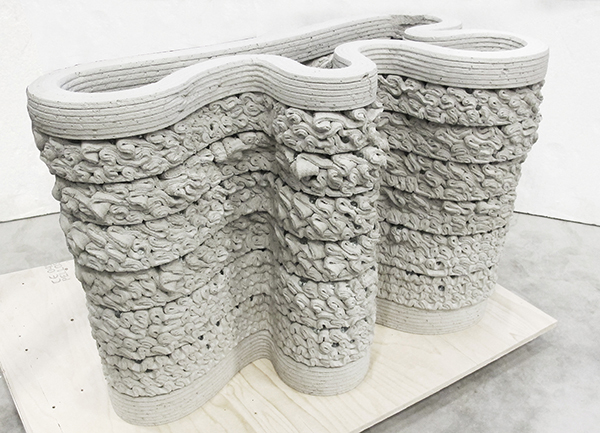 Bekkering Adams Architects together with Cement&BetonCentrum and TU Eindhoven developed a design where the possibilities of 3D Concrete Printing are explored. The prototype will be exhibited during the construction fair BouwBeurs 2017 (Feb 6-10, Jaarbeurs Utrecht). Three prototypes were designed during the Tectonics Design Challenge 3DCP and developed by three selected architects: Bekkering Adams architects (The Firewall), Bierman Henket architecten (Economy of Nature) and Movares Studio (ESOffice). During BouwBeurs 2017, the results of a year further design and engineering will display the latest capabilities of 3D concrete printing, showing the architectural potential of this innovative technology. At least as interesting as the final concrete prototypes are the stories about the process of design and engineering. 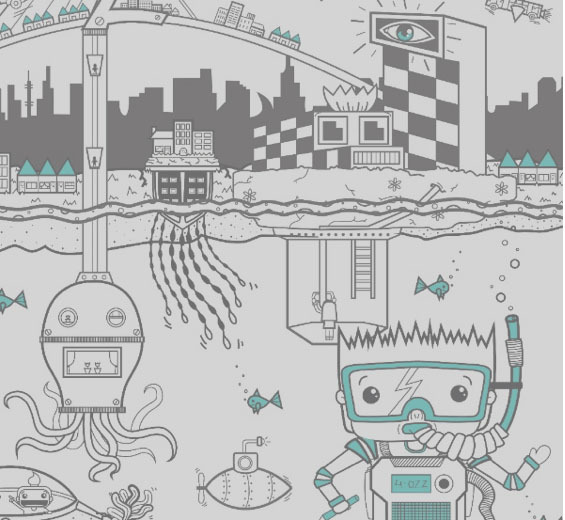 The printing technique brings the profession of designer and producer namely closer together. The participating architects of the Design Challenge and researchers from the 3DCP projects will share these stories with the public on Wednesday February 8, 8:00 am to 11:00 (preliminary planning) in the plenary theater in Hall 9. Bekkering Adams design proposal for the Belgenmonument in Amersfoort has been published in the catalogue of Ontwerpwedsrtrijd Belgenmonument Amersfoort FASadE. The proposal reflects on the original meaning and purpose of the monument. Our aim was to get back vividly the story and the emotions that the monument intended to express. Implementing the three existing zones with interventions that strengthen and intensify their significance. The Pad der Droevenis depicts the terror of war with concrete poles, bowing slightly, reinforcing the feeling of a trench. The Geheime Tuin offers self reflection and scattering through an intimate path towards the heart of the garden, surroundend by water, lights and flower that reflect on the water surface and multiply in the minds. The Voorplein stands for cheer. Here, in the square of the monument annual events can take place like the memorial of First World War, refugees meetings or classical concerts.